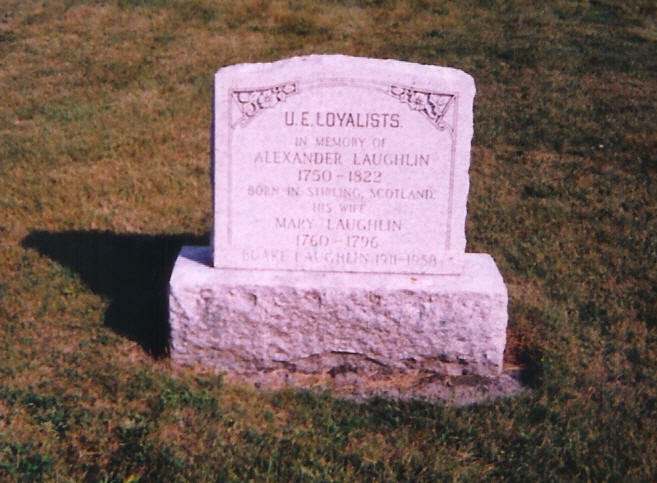 As son of U. E. L., Alexander Laughlin, Ernestown. Fell off a wagon and died of his injuries. This History of Jacob includes the complete works of Dr. E. Ross Laughlin's Jacob line. Jacob was the youngest son of Alexander Laughlin. He lived with his parents on their 100-acre Farm Concession 2, Ernestown, Lennox, Ontario, Canada, West half of Lot 17. He moved with them from that Farm to a 200-acre Farm, Concession 3, Ernestown, Lennox, Ontario, Canada, Lot 28. Jacob enlisted in Company D. of Washburn Company Militia of Canada and served for two years during the War of 1812-1814. He was actively engaged in battle at Fort Niagara on December 10, 1813, at Lundys Lane July 25, 1814 and at the siege of Fort Erie in September and October of1814. He was discharged at York as a Private on March 24, 1815. His discharge paper stated that he was 5 feet 6 inches tall, and that he had been born in Marysburgh. His place of residence at the time of his discharge was Camden East. Although his discharge paper indicates his name as "Jacob Laughlin", he signed his name as "Jacob McGlaughlin". All his children were known as McLaughlin. When he petitioned for land, he spelled his name "Laughlen". When he married, his given name was recorded as Isaac, which was possibly his "real" first name. He married Ruth Johnson of Ernestown and they lived in Yarker, Ernestown, Lennox, Ontario, Canada for many years. Jacob was a Labour. He changed his name to McLaughlin and his descendants carry that name. No headstones could be found at the Yarker and Wilton cemeteries, so their graves were probably unmarked. This information was collected by Edgerton Ross Laughlin, probably from the Archives of Canada, although he does not note the record number: The following petition for Crown Lands was directed to His Excellency, Sir Peregrine Maitland, K. C. B., Lieutenant Governor of the Province of Upper Canada and Major General commanding his Majesty's forces in the same, etc. "The petition of Jacob Laughlen of the Township of Camden, humbly sheweth that your petitioner is the son of Alexander Laughlen of the township of Ernest Town, a United Empire Loyalist; that your petitioner has attained the age of twenty-one years, has taken the oath of allegiance and did his duty in defence of the Province during the late war as will appear by the annexed certificates and has never received any lands from the Crown. Your petitioner therefore prays that your Excellency will be pleased to grant him 200 Acres of the waste lands of the Crown and permit Isaac Fraser, Esq. to locate the same and take out the deed when completed; and your petitioner as in duty bound will ever pray, &c. " Sworn in open sessions on April. 27, 1819 (Thomas Markland, chairman). [S274] Loyalists in Ontario, The Sons and Daughters of the American Loyalists of Upper Canada, William D. Reid, (Name: Genealogical Publishing Company; Date: Jan 1, 1994;), Page 178. [S489] 1851 Census of Canada East, Canada West, New Brunswick, and Nova Scotia. [S372] Reverend Robert McDowall Marriage Register.